A bounty of fresh tropical fruits to tantalize the taste buds. Arrives with a pot of beautiful Orchids and Berries. 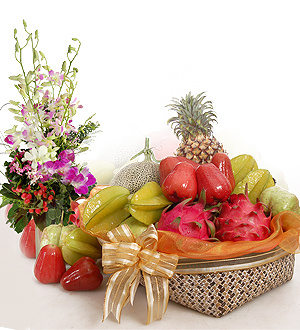 Fruits include Pineapple, Melon, Starfruits, Dragonfruits, Rose Apple and Guava. Same day delivery applies for order made before 12pm on a working day. For out of Klang Valley, Malaysia delivery, pot and accessories displayed are subject to availability and may be replaced with similar or higher value items. Call Giftlab at 03-78830233 / +6012-6915200 or email us at sales@giftlab.com.my for assistance.